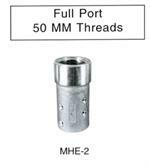 Extra-large style with 1-3/4 Gasket ID to allow for full flow on larger hoses. Standard style with 1-1/4 Gasket ID. Interchangable with all major brands. 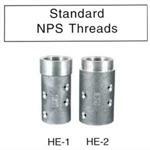 1-1/4-11 NPS threads to fit standard threaded nozzles. Manufactured to accepted industry standards and inter-changable with all major brands.